Every now and then something catches my eye and I think, I've got a cartoon about that ... somewhere! It was the same with an article that I was reading in a local paper someone had sent me from the North of England. In it the writer was telling her readers that if disabled people wanted to fit into society more easily, they should concentrate on looking more normal .... I kid you not! I'd looked through my computerised cartoon catalogue (I've now got over a thousand cartoons in it!) and I still couldn't find the one about 'normality training' when I suddenly remembered. A little while ago I produced some cartoons for Colin Cameron, who had written an article for DAO regarding the Affirmative Model of disability. I'd actually produced about three cartoons for the article and I think our Editor (also a Colin) had ended up using all three. 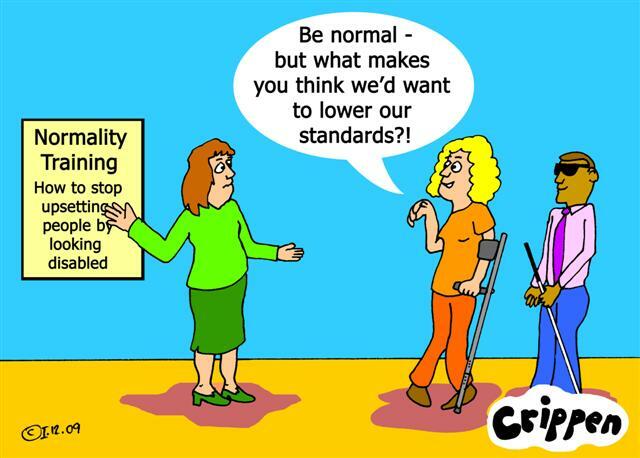 The 'normality training' cartoon was one of the three. Now the cartoons that I produce for articles like this are filed in a seperate folder on the 'puter called special commissions. It hadn't occurred to me to place a copy of each of these cartoons in the general calalogue section. So there they stay, usually never seeing the light of day again unless something like this occurs. So I'm now going through all of the seperate commissions I've received over the past decade or pulling out the various cartoons and seeing if they'll do for the general catalogue as well, albeit with a few tweaks to make them less client specific. If I find anything else that I think is worth a second airing I'll post it up along with the story behind it. By the way, if you missed Colin's article on the Affirmative Model please click on this link and it will take you to it. Thanks.